The Study “From Refugees to Workers”, carried out by the Migration Policy Centre and recently published by the Bertelsmann Stiftung, will be presented in Barcelona on the 29th November, in Vienna on the 5th December and in Brussels on the 8th December. On the 29th November, Prof. Iván Martín, Coordinator of the Study, and Albert Arcarons, country case study author for Spain, will present the study at the University Pompeu Fabra in Barcelona, in the framework of the Interdisciplinary Group on Immigration (GRITIM), in a session under the title “Labour Market Integration of Refugees: What Do We Know (and How to Learn More)?”. See programme and invitation here. On the 5th December, Prof. Iván Martín. Of the Migration Policy Centre, will present the same study at the Wiener Institut für Internationale Wirtschaftsvergleiche (WIIW) in Vienna. The presentation will take place in the framework of the cycle “Policy Perspectives for European Integration” under the title “Labour Market Integration of Refugees: What Works?”. The WIIW carried out the country case study for Austria. See programme and invitation here. Finally, on the 8th December, Joscha Schwarzwälder, Project Manager at the Bertelsmann Stiftung, will present the study in the framework of a lunch debate at the European Trade Union Institute in Brussels. See programme and invitation here. 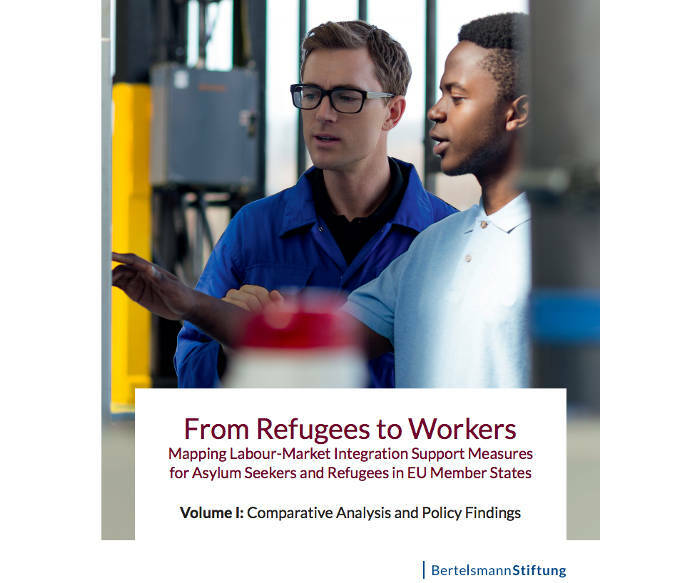 The Study “From Refugees to Workers”: Mapping Labour Market Integration Support Measures for Refugees and Asylum-Seekers in EU Member States” is based on nine country case studies. It reviews 94 concrete support measures for skills assessment and skills development, economic incentives for integration, job intermediation, recognition of skills and qualifications and “integration packages”.